Help Los A﻿ng﻿eles Save the Drop! In partnership with the City of Los Angeles, the District is asking you to help LA Save the Drop! Save the Drop is a water conservation campaign sponsored by the Mayor's Fund for Los Angeles. California is experiencing its fourth year of drought, as a result Mayor Eric Garcetti has asked all Angelenos to conserve water through his city-wide Call to Action and his #DroughtHack campaign. Do you know California is experiencing its 5th year of drought? Did you know you can be part of the solution? In order to raise awareness and encourage students to think about the ways they can help alleviate the drought, the District hosted a campaign challenging schools to Save the Drop! Registration for both contests is now closed. Students at Fair Elementary are doing their part to Save the Drop by working in their native plant garden. Want to be featured on our Save the Drop page? 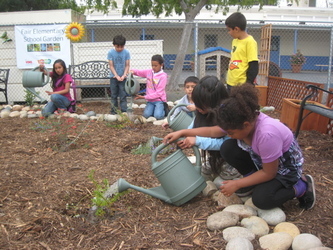 Let us know what projects you are doing to conserve water at your schools. Check back and you could be featured online! I Pledge to Save the Drop!